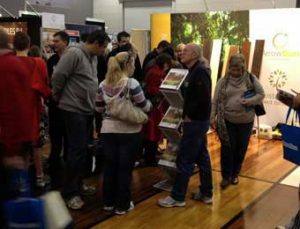 It was amazing to see the great response from all visitors at the Melbourne Home Show in April 2013. 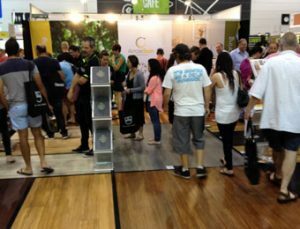 During the 4 very busy days it was so rewarding to see the strong response towards our beautiful range of designer colours, this great range stimulated the eyes of all potential buyers. One colour that really took centre stage was European. European is such a beautiful product with a real classic appearance showing natural variation in colour. To achieve this unique look we carefully select a mix of natural oak shades and blend them together, then once installed on your floor you get the look of solid timber. Because oak is so heavy it feels like a solid timber floor as well. But there’s more! Grand Oak has a janka rating of 15.8, this makes it harder than all the timbers grown in Australia so when it comes to indentation you can’t go past this product. Also during the show we demonstrated how easy it is to clean and remove any scuffs that appear on the surface, this was amazing to those who had the chance to see how a floor can have thousands of people walk on it then look so new again. We would like to thank the public who have showed such interest in our products and to all the fantastic retailers who supported it making the event a great success.